Let Tap Master Inc. install your Thermowell or Flow Meter unit while the system is up and running. We can successfully install the them on copper, steel, PVC, ductile, and ACP. We have all the right fittings and technology to get your job done safely. Thermowells can be successfully installed without a shutdown of your system. Tap Master can install all of your energy management hardware while your system is under full operating pressure. Thermowells can be safely installed on steel, plastic, copper and other types of piping. Available in weld-on or bolton. Tap Master's Thermowell fittings work great with everyone's Thermowell housing and are adaptable for any length Thermowell. 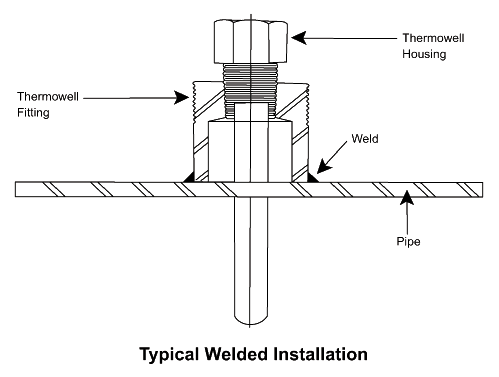 The installation of the Thermowell consists of welding or bolting the Thermowell fitting to the piping, perform the Hot Tap, and then insert the Thermowell housing into the fitting. This is done without leaving a valve. If you prefer to leave a valve, there are other varieties and styles available, please call to discuss. The Thermowell fitting has been welded to the piping and a temporary access valve has been installed and pressure tested. After testing the fitting and temporary valve, the hot tap can be made into the pipeline. 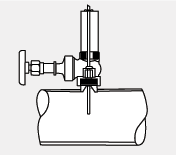 After the drill is retracted above the valve is closed and the tapping machine is removed from the line. 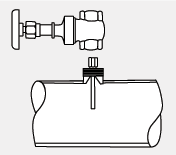 The valve is opened and the Thermowell Housing is pushed past the valve and threaded into the inside thread of the Thermowell fitting. 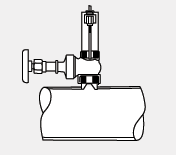 When properly installed, the pressure is sealed off by the Thermowell Housing and the temporary valve can be removed. A wide variety of thermowell housings can be installed into any type of piping. In this particular case, the piping is steel and the Thermowell fitting is welded to the pipe. With non-weldable pipe a bolt-on saddle may be supplied.